My family goes a little overboard with desserts, so when I was home for Christmas the options were bountiful. Literally every family member bakes cookies (I’m not even being facetious…all six people made a variety of cookies). I made unreal cinnamon rolls on Christmas morning (see separate post). 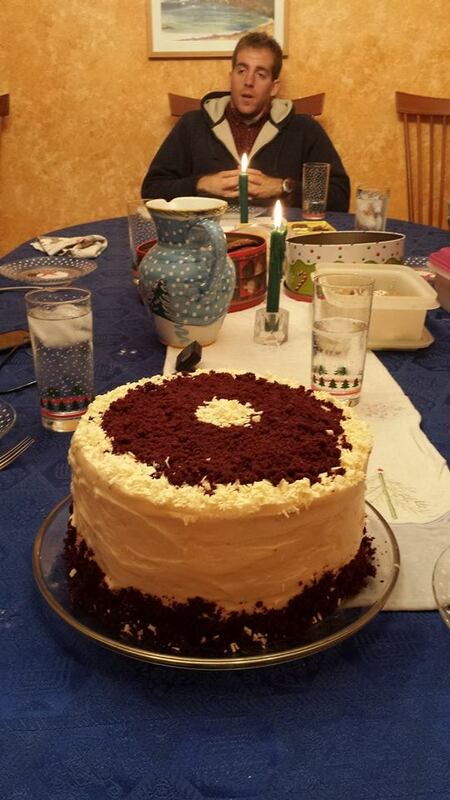 And of course, we had a cheesecake cake because why not? This was really just a combination of three of my favorite recipes: red velvet cake, cheesecake, and cream cheese frosting. The only difficulties were baking in my parents’ kitchen (without my known baking pans and finicky oven) and the assembly of a crustless cheesecake between two layers of cake. The former was not too much of an obstacle, but the latter was kind of a challenge. I had no idea how to transfer the cheesecake from the springform pan to the cake. None of the recipes for cheesecake cakes seemed to have any sort of directions for how to do this. My dad and I thought up all sorts of ideas while the cheesecake was chilling in the refrigerator, but the only one that seemed like it would work was flipping it onto my hand and onto the cake (I know, sanitary). All other options at the time seemed like it would result in complete cake disaster. So, if you have any tips let me know! 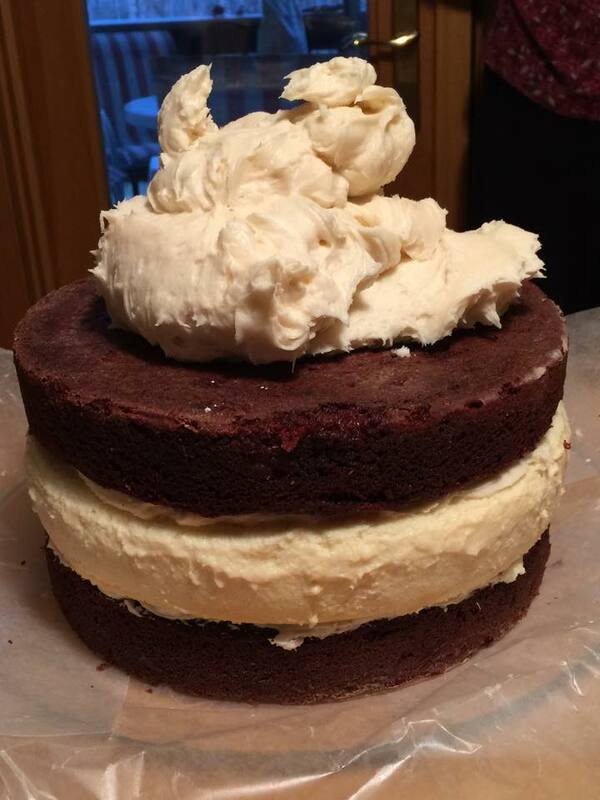 My original intent was to have two cheesecake layers and two red velvet cake layers, but I couldn’t figure out how to halve the cheesecake and transport it. If I make this sort of cheesecake cake again, I will probably halve the cheesecake recipe (there really was a lot of it), or make an 8″ round version with three cake layers and two cheesecake layers (but this would require an investment in 8″ round pans). Based on recipes found here, here, and here. For the cheesecake: Heat oven to 350 degrees. Wrap inside/bottom of a 9″ springform pan with parchment paper (this will make transport easier after baking). Lightly butter the springform pan. In Cuisinart food processor, beat softened cream cheese, sugar, and heavy cream until smooth (maybe :30 to 1:00 or less). Add in eggs, vanilla, and ricotta, and mix until incorporated. Pour into prepared springform pan. Bake for 60-90 minutes or until the top of the cheesecake begins to turn light brown. The sides will likely appear cooked, but the center of cheesecake will likely still be jiggly and will continue to cook/settle as the cheesecake cools out of the oven. Cool thoroughly. Once cheesecake has cooled completely, cover and chill in refrigerator overnight. Once chilled, run a metal knife/spatula along the side of the cheesecake to loosen, and remove the side of the pan to serve. For the cake: While cheesecake is in the oven prepare the cake. Butter and flour two 9″ cake pans. Line with parchment paper, then butter and flour the parchment paper. In a large bowl, sift flour with cocoa, baking powder, baking soda, and salt. Set aside. On medium-high speed using an electric mixer, cream the butter with the brown sugar. Reduce mixer to low speed and add the red food coloring and vanilla until combined. Increase speed to medium-high and beat until aerated and pale (about two minutes). Reduce the speed to medium and add the eggs, one-at-a-time, beating thoroughly between each addition and using a spatula to scrape the bowl as necessary. Reduce the speed to low and add one-third of the dry ingredients, followed by half of the buttermilk. Repeat, finishing with the final third of the dry ingredients. Scrape sides of bowl with spatula and divide the batter between the cake pans. Bake at 350 degrees for approximately 40 minutes or until tester inserted into the center comes out clean. Let cake pans cool for about 10 minutes, then invert the cakes onto a cooling rack until completely cooled. Once cheesecake have cooled completely, cover and chill in refrigerator overnight (this is necessary for all cheesecakes). Once cakes have cooled, wrap with plastic wrap and chill in refrigerator overnight (this will make leveling and frosting easier). For the frosting: The following day, once the cakes and cheesecake are chilled, cream the butter in a stand mixer on medium speed. Add cream cheese and continue to mix. Slowly add the vanilla and confectioner’s sugar, pausing intermittently to allow the sugar to incorporate into butter/cream cheese. For assembly: Level both red velvet cake layers, reserving the tops in a medium-sized bowl to create a crumb topping later (if desired). Run a knife along the side of the cheesecake to loosen, and remove the side of the springform pan. Carefully flip the cheesecake onto the bottom layer of cake and remove the parchment paper. Top cheesecake with top layer of cake. Frost the cake with the icing. Decorate with cake crumbs and white chocolate shavings.